No, I’m not vegan. And I have NO intention of ever giving up animal products or animal by-products. But I like EVERY ingredient in this salad. I can’t imagine it won’t taste delicious. So this is an EASY recipe that I’ll be trying this weekend. I might even pair it with a grilled white fish. And crisp, fruity glass of white wine. Let me know if you do and what you think. PS- I found this recipe at CookingChannelTV.com. My dear friend #TwitterlessHarvey has introduced me to many Atlanta restaurants. I have to admit DineWithDani might be better named anything that references him. My favorite of all of our restaurant outings has to be the cooking class with famed Atlanta chef Paul Luna– of Loca Luna and Eclipse Di Luna popularity. While he is no longer affiliated with those establishments, in 2010 he embarked on a new venture in Downtown Atlanta, Lunacy Black Market. Located on Mitchell Street between Spring and Forsyth, this small eatery is only open for dinner Wednesday through Sunday. But one particular Tuesday evening, Chef Paul opened his doors for three of his favorite customers and me. I had never eaten at Lunacy nor had the pleasure of meeting Chef Paul—so I jumped at the chance to join Harvey for a cooking class. Upon arriving, we sat in the small dining room designed purposefully with mismatched tables and chairs, mismatched glassware, flatware and silverware, and artwork that made me do a double take. I thought that was where we would spend our night, but when Chef Paul called the four of us into the kitchen I got giddy; we were going to get a live cooking demonstration in his kitchen! And so we did. The kitchen, much like the dining room, was a hodgepodge pieces with nothing matching. So naturally I loved it. Even though he is known for his “flamboyant” and “over-the-top” personality, I was pleased and put at ease with his casual warm manner. He didn’t tell us what we were doing or making. And after ensuring we all had a glass of wine he dove right in. First, let me start with two things: (1) Ceviche is a South American dish; the country of it’s exact origins is not clear. (2) It can be served many ways; so don’t be disappointed if it looks different every time you order in a restaurant. Sometimes its fish, shrimp, scallops, calamari or a mix of all of that and more. Whatever the main ingredient, I prefer mine fairly spicy and without tomato sauce or fruit. 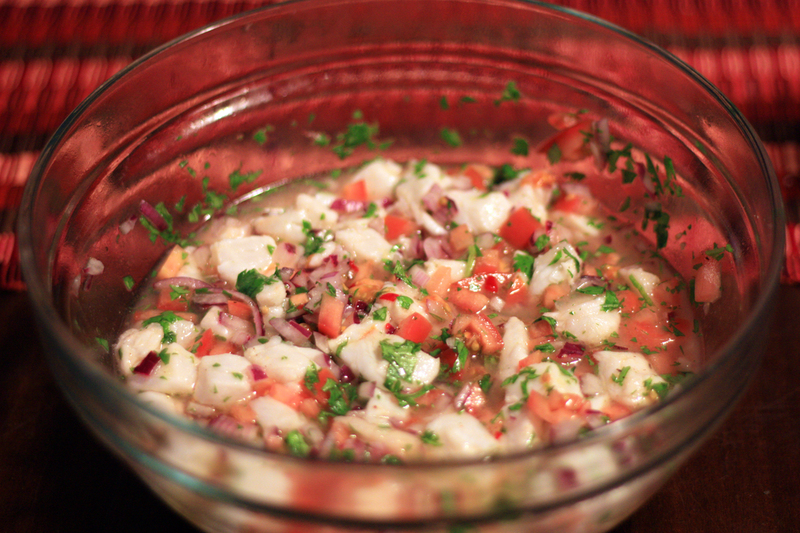 That type of Ceviche is one of my favorite things to make now that I know how easy it is. While hanging at the bar formerly known as Beleza, the chef shared a simple recipe with me. I of course modified to fit what I had at home. It came out pretty good, so I tried it again with better ingredients. And here we have my personal simple recipe for Ceviche.